Recently, Joybird conducted a style review using Google Trends data. 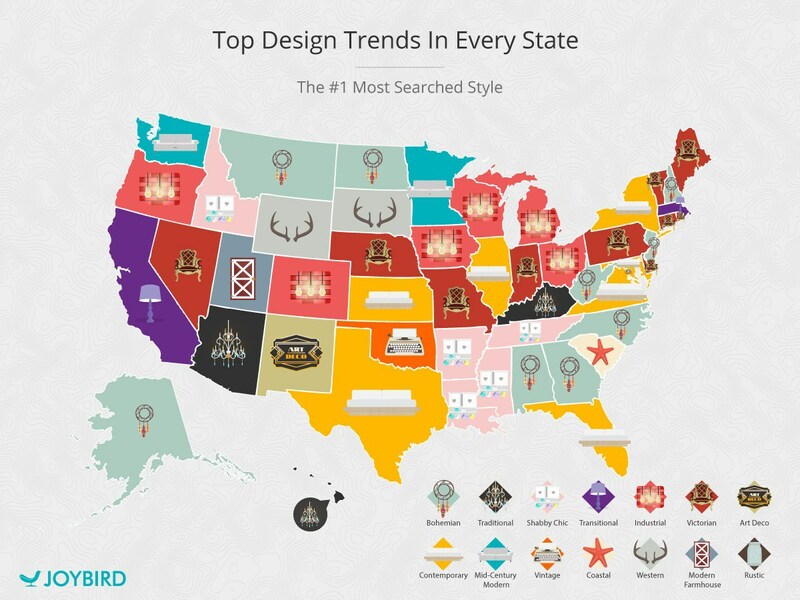 Joybird built a list of décor styles and looked at the search popularity for fifteen of the biggest interior design styles in each state over the last twelve months. From there, they found data for each style, cross-referenced them by state and mapped them out. When it came to the most-searched design term, two styles dominated the map — Victorian and bohemian. 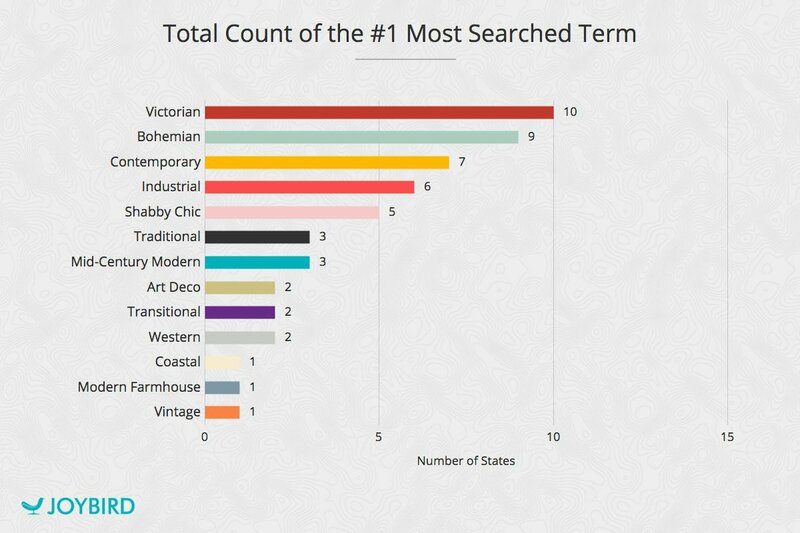 Victorian was the top search in ten states, the most out of any style. Bohemian was right behind it with nine states. Interestingly, out of the fifteen styles Joybird looked up, only thirteen were represented. Rustic and casual modern were not the top search for any state. Additionally, southern states tended to agree with one another in the top searches, having roughly 4 styles appear, whereas states in the west tended to have differing style preferences with about 10 styles appearing. Modern Farmhouse, the go-to style for HGTV star Joanna Gaines, was surprisingly only the most-searched style in Utah. There are also a handful of anomalies—Idaho with the shabby chic and Kansas with the contemporary—that stand out from the states that they are each surrounded by. When it came to the second most-searched design trend term, bohemian and Victorian were popular again. Bohemian led with thirteen states and Victorian had seven. Mid-century modern had an increase, leading in five states as the second most-searched term. Victorian proved it’s popularity for the third most-searched design term, however other styles had more representation than before. Transitional, modern farmhouse, and traditional all had additional states. Overall, Google Trends provides an interesting way to see what people are searching for in different areas of the country. When it comes to interior design trends and styles, everyone is different, but it’s clear that many people are searching for the same styles in various regions. 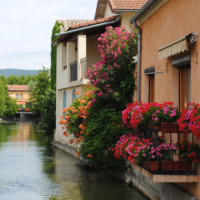 How does this study align with your client preferences?? Here’s another interesting infographic I came across spotlighting colors by cultures and religions.